New research on the Allegheny River finds that despite some mutations, it’s among the best smallmouth rivers in the Eastern United States. Above, pro-angler Michael Bennett of Lincoln, Calif., fishes the Allegheny during the 2009 Forrest Wood Cup. Invasive Asian carp are moving up the Ohio River, Marcellus Shale sites are spreading down the Monongahela, and most of the Allegheny River locks are almost certain to be closed. 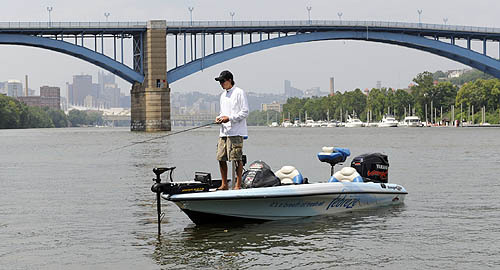 At the same time, mayflies are hatching at The Point, native trout are spawning in the upper Allegheny in numbers unseen in generations, and twice in the last five years Pittsburgh water quality was spotlighted in two world-class bass fishing tournaments. What’s going on, and whatever it is, is it a good thing or a bad thing? “That’s a good question,” said John Arway, executive director of the Pennsylvania Fish and Boat Commission. At two recent public meetings in Monroeville, he and PFBC staff unveiled a draft management plan Arway said would seek to provide answers and act decisively on what is found. The new plan is part of a broad-reaching initiative the Fish and Boat Commission says will research, monitor, utilize, protect and enhance wildlife in the state’s three great rivers — the Delaware, Susquehanna and Three Rivers system. At a time of dwindling resources and rising costs, Arway said the plans would be accomplished without incurring new costs by reassigning personnel to new duties. • Human activities, including navigation dams, pollution and other threats. • Commercial dredging on the Allegheny and Ohio rivers. • In-stream and streamside habitats, determining their values and assisting in conservation and restoration efforts. • Long-term monitoring studies of nongame fish. • Monitoring and promoting sport fisheries. • Providing and encouraging opportunities for anglers, boaters and the general public to understand and embrace recreational river resources. PFBC biologist Bob Venturini said the plan would research catfish on the Three Rivers, and further promote flatheads and channel cats as an angling resource. The agency would work with the Army Corps to determine the practical considerations and wisdom of placing fish passage structures on the dams — they’d permit natural fish migration, but also provide passage for Asian carp and other invasive species. Venturini said the plan would also investigate muskie and trout reproduction on the upper Allegheny. One of its goals would be to consolidate and enhance smallmouth bass research recently conducted by the National Fish Health Research Laboratory. The study found cases of intersex mutation — fish having both male and female cells — in fewer than 10 percent of bass surveyed in the Allegheny River at New Kensington. If that sounds scary consider that in the Susquehanna River, intersex mutations were found in 90 percent of the fish surveyed. Although some of the research elements of the Three Rivers Management Plan predated his tenure, it’s considered Arway’s first big signature initiative since he replaced Doug Austen as PFBC executive director last March. The initiative is the culmination of work started by the Three Rivers Ecological Research Center, a $168,000 per year project backed by Austen that was scrapped when Arway took over. The draft management plan will be up for a vote when the Fish and Boat board of commissioners gather at their spring meeting. A summary and the full plan are posted on the agency’s website at www.fishandboat.com/ThreeRiversPlan.htm, and a public comment function is provided. The deadline for input is April 30.